Spinach | Izzy have you eaten? Dhal, shall we do the Sambar? Hehe! Sorry for the cheesy title, but I could not resist. As you know, I hardly ever make ‘dhal’ as such. It is usually sambar in our house. Why? 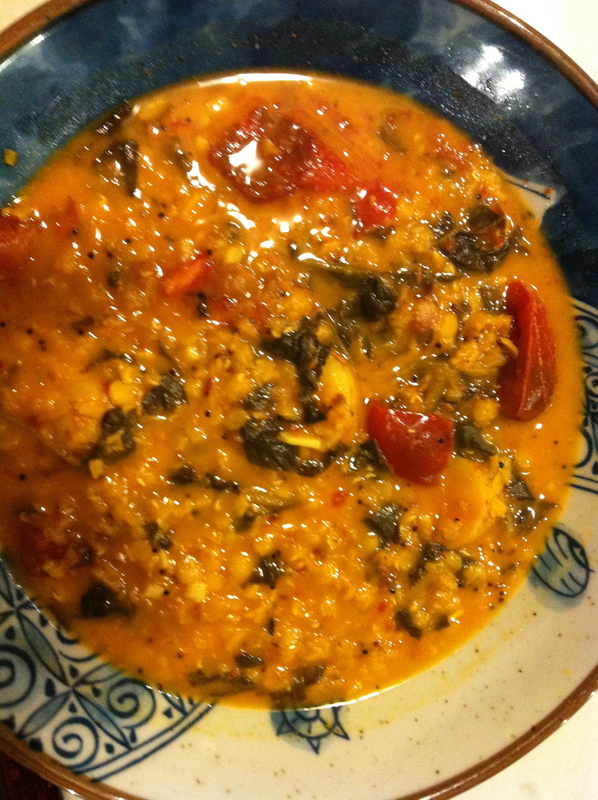 Well, the first is a a very simple and straightforward dish with lentils as its main ingredient. Turn it into a good South Indian sambar, and you can combine the lentils with a whole lot more, and it is a meal in itself. 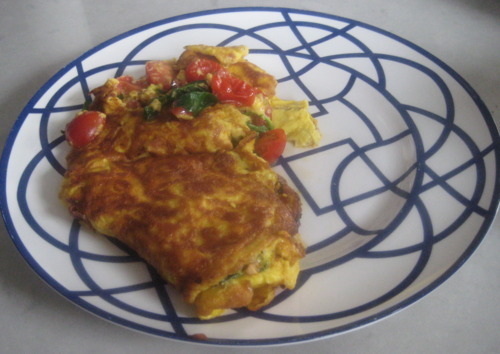 We love it with spinach and tomatoes, carrots and potatoes. You can add whatever vegetables you like to it: okra, sweet potato, capsicum, zuchini. About the best veggie stew around, in my opinion. I had to put this one up for you Izzy. 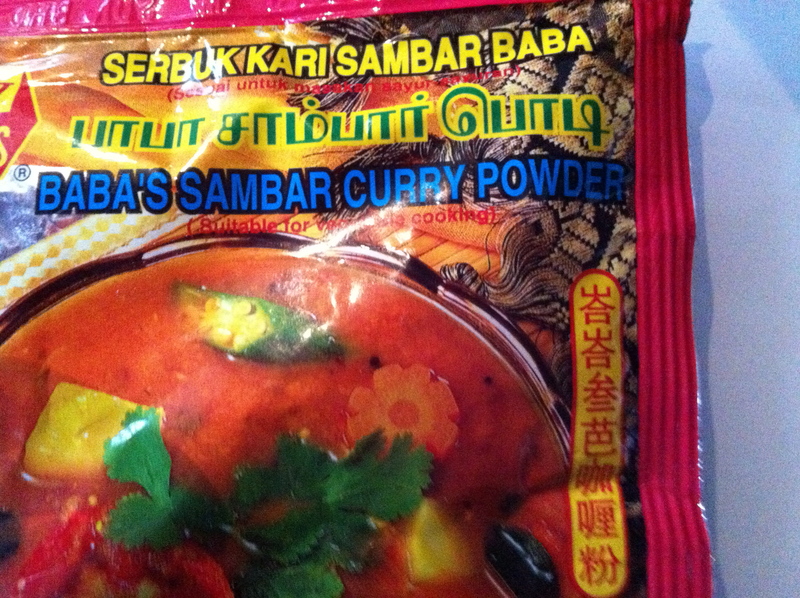 Let’s face it: you are a sambar girl from waaaay back. Birthday dinner requests, not feeling well days, absolutely starving days, this is the favoured option. We eat it over rice, and it goes well with an accompaniment of a dry fish or meat curry. It stands alone just fine though, and is always good with roti. And I like a pappadum on the side…..and some lime pickle! There are ingredients here you won’t have in your kitchen, but they are worth getting because dry Indian spices don’t go off quickly, and you’ll want to eat this dish again and again. And you’ll have all the ingredients right there! So healthy and nutritious, and it won’t cost you a bomb too. Stop into any Indian grocery store and they will have all the items you need. If you buy fresh curry leaves ( they are of course the best), you can store them in a bag in the freezer. They refresh beautifully when you throw them in hot oil. You can also pick up a nice package of chapatis, and some samosas to go with your meal…..Have a feast! about three cups of vegetables of your choice. Pick from yams, potato, tomato, carrots, eggplant, zucchini, mushrooms, capsicums, spinach, etc., cut into pieces. Throw in the mustard seeds, and wait for them to start popping. When the mustard seeds start popping, add the cumin seeds, the garlic and ginger. Stir well, and add the curry leaves, then the lentils after a few seconds. 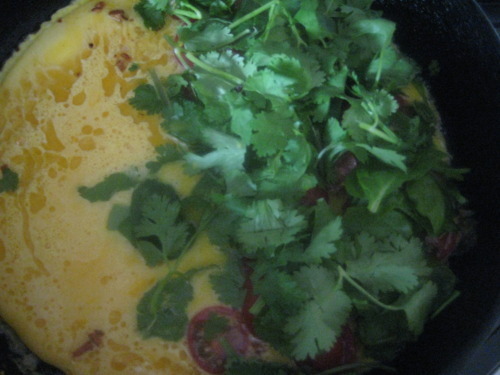 Add the sambar powder and stir everything well together. At this point, add your hard vegetables ( like root veggies if you are using any) and stir well. After about a minute, add a boiling jug of water to the lentils. reduce heat to a simmer, stirring well. Add more water so that there is about an inch above the lentil mixture at all times. The lentils will expand quickly and soak up the moisture, so watch the pot and keep adding water as necessary. Now add your softer veggies, like capsicum, tomato and zucchini if you are using them. Season with salt and lemon juice. The consistency of the sambar should be like a thickened soup: freely liquid, but also very thick. The lentils should be soft and mushy. Keeps well in the fridge for about 4 days.